Today, Team Ninja’s glorious action epic Nioh lands on PS4. 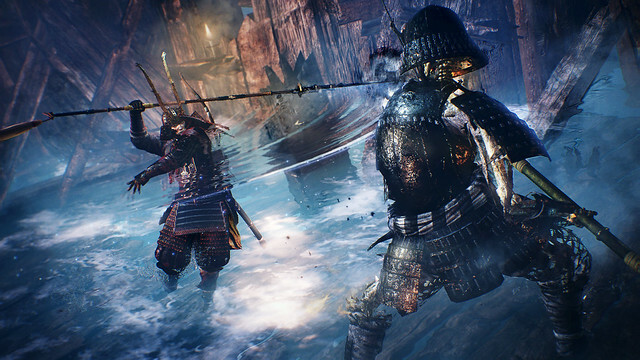 Fans of Bloodborne and Ninja Gaiden should take note: this is a demanding, tense action-RPG that pits you against hordes of samurai, assassins, and demonic Yokai. In honor of the game’s launch today, the PlayStation team amassed some useful tips that should help you hit the ground running. Read on to learn more, and if you’ve picked up a copy of the game, offer your own tips in the comments below! Embrace death. You will die. It’s okay. It happens to everyone. If you find yourself hitting a wall, try exploring a different area. Eventually you should be able to level up, grow stronger, and push onward. Don’t bite off more than you can chew. Engaging multiple enemies is possible, but risky. But if you find yourself dying in the same area to multiple opponents, try luring them apart one at a time with rocks or arrows. Stealth can pay off. 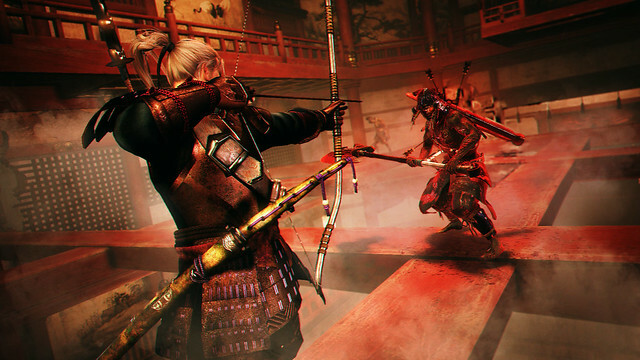 You’ll encounter many enemies on patrol routes in Nioh. With caution and a little planning, you may be able to avoid unnecessary fighting. Master stance switching. All weapons have three stances: high, medium, and low. Certain stances can be more valuable at different points in battle. For example, try using a powerful high stance attack to land an opening blow, then switching to faster mid- or low-stance attacks to keep your enemy off-balance. Alter your fighting stance to suit the encounter. Wind-up times take longer and strike harder in a high stance. If you find yourself battling a quick enemy, a low or mid stance will make these encounters more favorable. Experiment with different weapons. Once you find a weapon you like, it’s logical to invest in it. But don’t neglect the vast arsenal at your disposal, especially in your quick-swap slot. Different weapons are better suited to different situations, depending on the enemy and environment. The katana is a good beginner’s choice. Team Ninja recommends starting with the katana, which offers a good balance between offense and defense. To unlock the katana’s true potential, practice smoothly changing stances while attacking. Don’t forget to lock on. In battle, it’s usually smart to lock onto your target using R3. This has the added benefit of revealing your enemy’s health and Ki gauge, useful information that can affect your strategy. Learn to evade. Tap the X button to evade enemy attacks. This is particularly important if you see a powerful wind-up attack coming; even if you block it, your Ki gauge will be devastated. Explore the Guardian Spirits. Guardian Spirits are familiars that can unlock new benefits or assist your battles in different ways. They also enable a Living Weapon, a powerful attack that you can enable by pressing Triangle and Circle when the meter in the upper-left hand corner flashes. Block attacks! Blocking can be vital to your survival — hold L1 to defend against incoming attacks. But be warned: you’ll regenerate Ki more slowly while defending, and each blocked attack will reduce your Ki. Be fluid with your movement. Dodging in aggressively and striking, then dodging away is an excellent technique. Be aware of your surroundings and don’t be afraid to take your time in larger encounters. Master the Ki Pulse. Ki is a resource that fuels your attacks, dodges, and evasive maneuvers, but it’s also the secret to the essential Ki Pulse technique, vital for fighting Yokai. There are two main cues to help you find your Ki Pulse timing: your Ki bar, and the blue orbs that surround William. Look for the depleted section of the Ki Bar to fill with blue, then tap R1 to trigger the Ki Pulse. Or, look for the blue Ki around you to reach its maximum point. Play around with your combos to find the timing that works best for you — you’ll thank us later. How to fight Yokai. 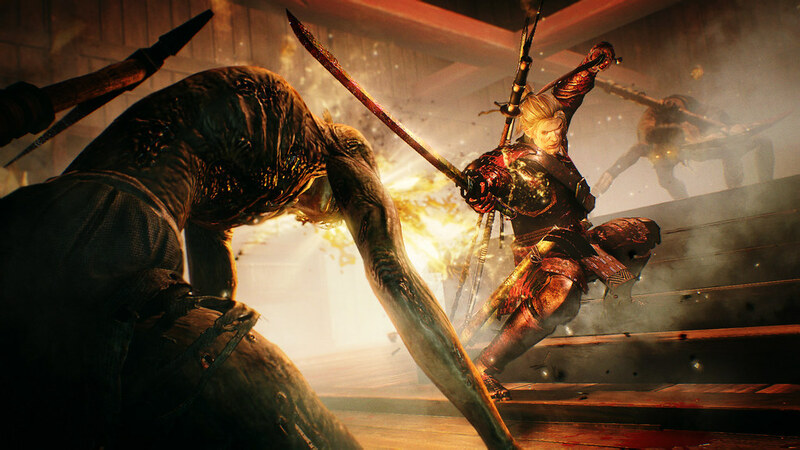 Yokai, Nioh’s dangerous demonic foes, emit an aura called “Yokai Realm” that slows down your Ki regeneration and makes you more vulnerable to incoming attacks. Activate a Ki Pulse while inside the aura to purify yourself, then send your foe hurling back to the underworld. Grappling is good. When your enemy’s Ki is depleted, your targeting reticle will turn red. Press Triangle to initiate a powerful grapple that inflicts significant damage. In long-range combat, aim for the head. If you haven’t alerted a distant group of enemies, take your time and get that crucial opening headshot using your projectile weapon. If the blow knocks off the helmet of an enemy, try to re-acquire the shot and fire again for massive damage. Secrets of the Spirit Stones. Spirit Stones do more than just provide you with more Amrita (aka currency). They also charge up your Guardian Spirit. Don’t go head to head against those bosses alone! Respect the environment. 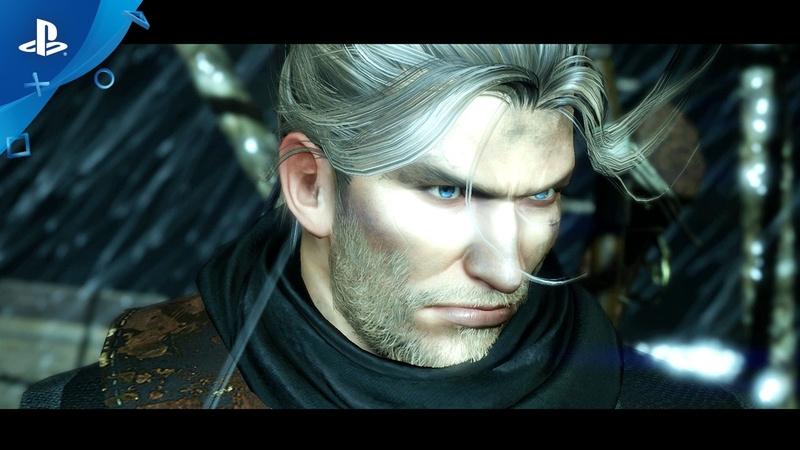 The world of Nioh is filled with death, but it is also filled with opportunity. Pay attention to the various opportunities that lie within the many paths before you. Some of them may aid your journey in ways which are not immediately revealed. Armored soldiers are dangerous but rewarding. First-time players would do well to avoid the deadly armored soldiers, most of which are stationed off the beaten path. 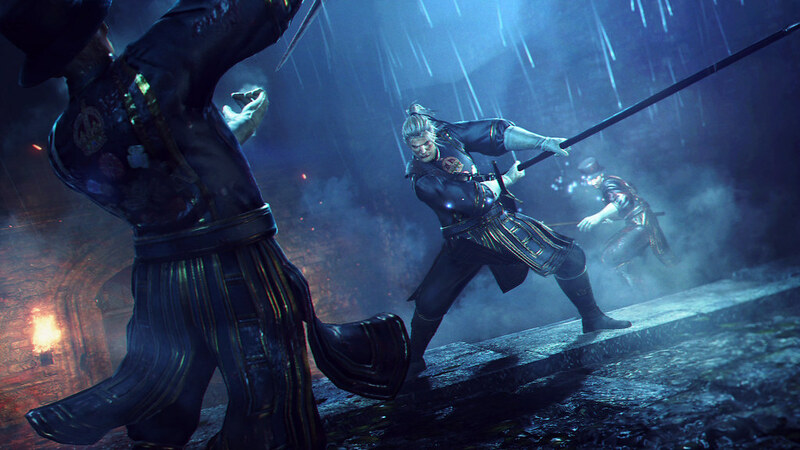 Once you master Nioh’s play style, try taking them on for a chance to earn high-performance equipment and unlock shortcuts. Beware the Revenants. The spirits of those who fell before you can drop some excellent rewards: Ochoko cups for summoning in other players in online play, and in some cases high-level purple gear. But be cautious: these optional encounters tend to be extremely difficult. Spirit is an important stat, even for strength-based characters. Spirit affects your overall magic power, but it also affects your spirit bond with your Guardian as well as extends the power of your Living Weapon. The passive stat boosts that accompany a greater bond with your Guardian are extremely useful — take advantage of it! Help the Kodama to gain an edge. Kodama are small, cute NPCs. If you manage to guide them back to a nearby shrine, they’ll offer you a powerful blessing that will increase the drop rates of various items for a time. These blessings can be lifesavers during some missions, so use them situationally and often. It can pay to sacrifice a good weapon to the Soul Forge. Consuming a higher attack-value weapon in the Soul Forge to upgrade a lower strength weapon with great prefixes can be extremely helpful, especially when dealing with elemental enemies. Sometimes it pays to take a break. It happens to all of us: during a tough encounter, frustration takes hold and caution gives way to reckless tactics. Trying another area or simply taking a break can help you see the encounter from another perspective. The last point is very important. “Sometimes it pays to take a break” About 6-7 years ago, I got into the Souls series with Demon’s Souls. I was advised by my local GameStop clerk that it was a hard game and that I would probably break my controller(never actually happened). I did hit a point where I couldnt figure out how to win against a boss and I just stopped playing completely out of frustration. About a month later I popped the game back in and had a new enthusiasm for it and completed it. A solid break can help you out a lot and clear your head. Happy hunting, friends. I had a similar experience with Demon’s Souls. I didn’t break a controller either but I got so frustrated with the final boss killing me over and over and taking my souls that I abruptly quit and deleted the game and saved games from my PS3!!!!! 1 hour later I was like WHAT DID I DO!? I started playing right away with a new found determination and calmness. I finally beat the game a week later! It was amazing how easy the game became after already going through it once. I killed many bosses on my first try. I always thought from that moment on that the Souls games were like a language that needed to be learned. TAKING A BREAK is such a good tactic! This happened to me as well with Dark Souls 3. I was getting a bit burnt out on souls games since i did DS1&2 plus bloodborne in the past 2 years. The final boss just completely wrecked me every time. I put it down for 3 months and came back. I went to test out the boss again and ended up beating him on my first try. This happened with me also but not on Souls games…its an universal truth that you can’t do s*** with your head hot and full of anger.So yeah facing a tough challenge always require a calm mind and if you really get mad at the game its better to quit and come back later…in such situations even your judgement of the game will change.So better to give it a time and come back another day….like some said in most of the situations you’ll come back to it and get through so easily that you won’t even believe. The only reason I’m up this early is because I’ve been playing Nioh since it unlocked at 9 last night. Yay for digital deluxe! Nioh is great and deserves the glowing reviews. ~Watch your stamina. Just as in Souls, ignoring your stamina will get you killed fast. ~Running away is often the better part of valor. If you see multiple enemies coming for you, run away to where you came from. Running into new areas will provoke a bigger mob. Then double-back and catch stragglers from behind. ~You don’t always have to make the first strike. Sometimes countering is better strategy and takes advantage of the enemy’s loss of stamina. Looking forward to reading other players’ tips. BUT FOR PETE’S SAKE, NO SPOILERS PLEASE!!!!!!!!!!! SUPER JEALOUS!!!!!!!!!!!!!!! To all that will be playing this gem today. Good Luck and I hope you all have fun. Going on vacation soon so I cannot afford it right now. Congrats on your game and I will pick it up shortly. Amazing tips! Won’t watch the video and won’t read the post too lol,I had ma fill of Nioh already…gotta keep the spoilers to a minimum.Can’t wait to play the full game though,glad to see it launching and I hope for a smooth release. Hopefully it sells good, going by the psn rating numbers from the pre-orders its not a huge success sadly. Really wish more ps4 gamers would buy games. Sony? Think of a better pricing model, times have changed. It may just be a title that didn’t get a ton of pre-orders, but sells great after all those glowing reviews. It wasn’t promoted like a first-party AAA title, so people were probably a little skeptical until they got the final word on how it plays. I’m guessing it’ll probably sell all year long, also. It’s one of those games people will continue to recommend for a while. There is absolutely no need to pre-order these days. With digital games there’s no shortage of physical copies. One thing NMS did right was prove this to millions of players. Thank God. Tecmo Koei know how to make games these Samurai/Ninja like games. Hopefully to try it out after clearing some backlog. So far unimpressed. It feels like Ninja Gaiden meets Dark Souls, but there is something clunky about it. It’s almost like there’s a smooth fighting game in there somewhere and they tacked on clunky Dark Souls style mechanics and animations on purpose. And there’s no good tutorial. I fear the freakishly good reviews were all from Souls fans. One of PS4’s greatest titles and that is saying something! Congrats guys! I will live by these tips. Got the game yesterday. Seems like it might be first Demon / Dark Souls type game I might actually play through. The feel of the controls is more fluid and I also like the setting / tone more. The UI in general and the ranged combat is also much better. Oh, and it has co-op option for the full campaign. Maybe after this, I’ll give that Bloodborne a try as well. So far loving it. Was able to snag a copy at my local GameStop as everywhere else in town for as already sold out. I like the setting MUCH more than Darksouls and Bloodborne. Plus I grew up with Ninja Gaiden and this has a that feel to it. It’s so smooth in combat. I wish they would of added more of their own ideas instead of just copy and paste from the souls games. Im still liking it but it just feels like more of the same. You dont have to reinvent the wheel, but at least add a few more spokes to it. I hate the way you have to travel in this game, the souls games flowed together, this just feels likes a bunch of un connected missions much like Metal Gear TPP was done. I hope things change soon or I feel I may have to walk away from it…!